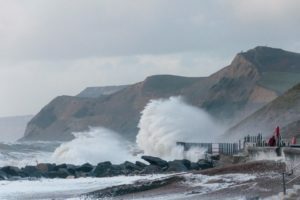 What will be the future of the Jurassic Coast? That depends on us. The coast is where land, sea and sky meet. It is a dynamic landscape where drama is found both in its nature and in how we as human beings connect with it. It can be beautiful but also dangerous, a place for joy or disaster. To protect the Jurassic Coast effectively we have to understand both sides of the story. The power of the sea is continually eroding the coastline. This is West Bay. To begin with we can look specifically at protecting the rock exposures, fossils and natural landforms that form the basis of our World Heritage Status. One process underpins all of these – erosion. Erosion is the natural process by which the sea and elements wear away the land, from small rockfalls to enormous landslides. The coastline only exists because of erosion and over time it has created the iconic landforms that so many people know and love – Chesil beach, Durdle Door, Lulworth Cove, Ladram Bay. Erosion keeps the cliff face fresh and the unique rock record well exposed, and as the rocks are eroded new fossils are revealed. Protecting the Jurassic Coast means allowing the process of natural change to continue. However, people can often be wary of change, seeing it as bad or even threatening… and of course it sometimes is. Houses, roads, towns and villages can be put at risk from coastal erosion. Rocks falls, landslides and mudflows can put beach users in danger and can even be fatal. It would be wrong to simply disregard erosion, or take it for granted as simply ‘a good thing’. Protecting and conserving the coast is about balance. We need to protect and celebrate all the wonderful benefits that erosion brings (without it the Dorset and East Devon coast simply wouldn’t exist as we know it) but also accept that at times the risks it poses will be too great. Within these complex and conflicting circumstances new coastal defences that seek to stop erosion may well be a necessary in some places, to safeguard coastal communities. Compromise is not unreasonable, but we can’t hold back the sea forever. Once we accept that erosion underpins the existence of this fabulous coastline we will be better prepared to defend it as a legacy for generations to come. In the long term do we want to see miles of concrete walls and rock armour? Our vision for the future is a wild and rugged coastline, majestic, beautiful, beloved by residents and visitors alike, overflowing with wildlife and ready to reveal its ancient stories about our world.